You're probably familiar with many of the risk factors of coronary artery disease, such as high LDL cholesterol, low HDL cholesterol, high blood pressure, diabetes, smoking, and simply getting older. We spend a lot of time talking about how to decrease these risk factors (well, other than the getting older one! ), so you likely know a lot about them already. But there's one risk factor you may not be as familiar with. This risk factor involves serum levels of uric acid, which is pro-oxidative and pro-inflammatory. High levels of uric acid also increase your risk of coronary artery disease and, as a result, your risk of heart attack or stroke. In fact, an increase of 1 mg/dL in serum uric acid levels causes your risk of coronary artery disease mortality to jump 12%. Fortunately, there's an easy way to lower your uric acid levels and your coronary artery disease risk. Researchers at the Aga Khan University Hospital in Pakistan were concerned about the coronary artery disease levels they were seeing in patients. So they decided to conduct a study to see if they could bring coronary artery disease levels down by reducing uric acid levels. Because they knew that almonds can help regulate lipid levels and reduce cardiovascular disease risk, they decided to investigate whether almond consumption affects uric acid levels. They recruited 150 participants who suffered from coronary artery disease, none of whom regularly consumed nuts or had nut allergies. They divided them into three equal groups. They asked one group not to consume any nuts, particularly almonds, for the duration of the study. The other two groups consumed 10 grams of almonds (about 8-10 almonds) per day, which they soaked overnight, peeled, and ate before breakfast. One of the groups ate almonds from Pakistan, while the other received almonds imported from America. The study lasted for 12 weeks. At the beginning of the study, the participants had similar serum uric acid levels, but by week six, the participants in the almond groups were already seeing an improvement. By the end of the study, their improvements were even more significant. 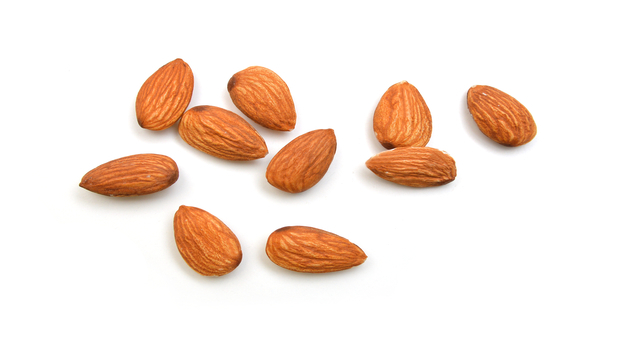 In the Pakistani almond group, women in particular had 16% less serum uric acid than the women who ate no nuts. And the women in the American almond group had 21% less. You don't need the results of this study to know that it's a great idea to add a handful of almonds to your daily routine. But it's a particularly good idea if you're worried about your coronary artery disease risk.